Last night we upgraded all of the security on our email server to the latest most secure versions. If you were using more current versions of your email client software such as Microsoft Outlook, or Mozilla Thunderbird, for example, you would not have experienced any changes or issues with sending or retrieving email. However if you are using older versions of email client software is is not capable of connecting to our servers with the new, more secure technology. Because we host accounts that accept credit cards for payments, we are required to keep our servers up to date and compliant with the latest security requirements. We must pass a quarterly PCI compliance scan to remain compliant. To continue to be able to send and receive emails my first suggestion is that you update your client software to the latest version available from the manufacturer. This is the safest and best solution. However, if that is not possible, you will have to change your email settings in your email client back to an insecure connection. 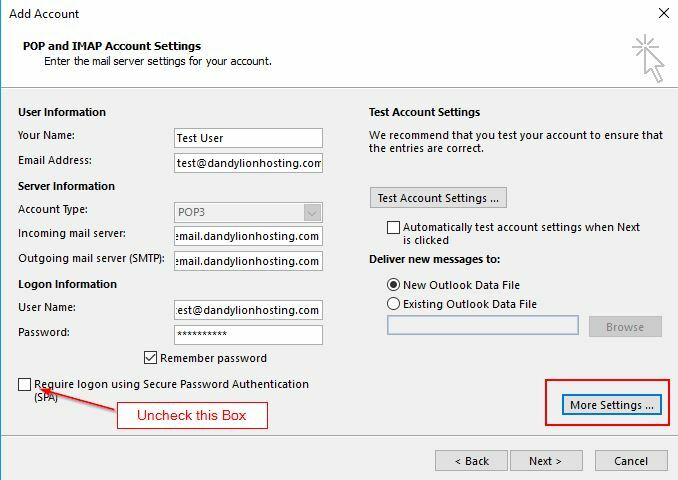 You can accomplish this go to your email settings in Outlook or whatever email client you are using and make the following changes. Depending on the version of software you are using, you can check our Knowledgebase for instructions for finding the location of those settings. When you first open up your settings you should see your email account. Highlight the account and click on change or edit as appropriate for the version of email client you are using. The next page you should see should look something like the image below. You should see a box labeled "Require logon using Secure Password Authentication". Make sure that box is NOT checked. Next, click on "More Settings" and you should see a screen looking close to the example below. Click on the Advanced tab and change your Incoming Server (POP3) to use post 110 and make sure that the box below that is not checked. 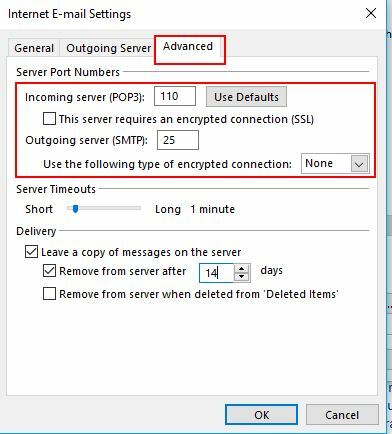 Change your outgoing SMTP server to port 25 and make sure that the encryption option is set to "none". Then click OK to exit and then click on the button to "Test Connections". Make sure the test is successful then click OK to exit. NOTE: If you are using an IMAP account change your Incoming Server (IMAP) to port 143 in the above example. Be aware that some IPSs block port 25, so if after you have made the above changes, you are still experiencing issues, please give us a call at 323-463-8300.